Harar, a city in eastern Ethiopia, is famous for the hyenas which prowl its back streets and scavenge in its rubbish heaps by night. 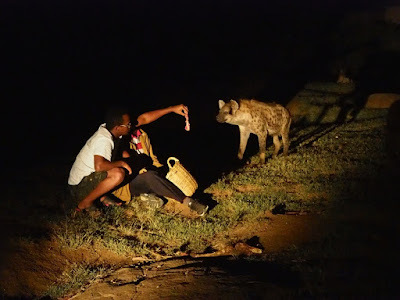 A couple of "hyena men" put on nightly shows in which they feed the beasts chunks of meat from their hands and mouths. Alas Harar's hyenas are too well-fed at the moment to be bothered with free handouts. Two feasts in the past week - the New Year plus a Muslim feast day - mean the city's rubbish dumps are piled high with the remains of slaughtered sheep and goats, and the hyenas just aren't interested in eating more. Still, I did see a few last night (one of which is pictured above), and I could hear their eerie, whooping calls all night.